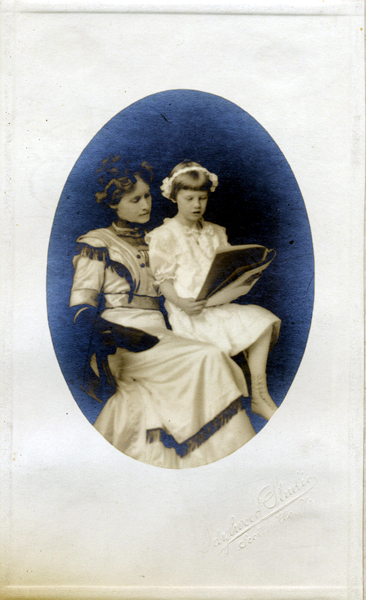 Comments: Mrs. Laura Colley reads to her daughter, Kathleen, in this Christmas time photo taken at Idylwood Studio. During the same session, William E. Burgess also took this photo at the right of Kathleen standing by herself. Laura was the sister of William Burgess, and these two photos were a Christmas gift to the Colley family from the photographer. Laura was also the sister-in-law of Captain John Pitts, who lived at Belle Haven, a Victorian house built on a hill overlooking the James River at Scottsville. Captain Pitts married two of Laura's sisters: first, Florence Burgess (1866-1894); and secondly, Helen Burgess (1869-1962). The photograph at right of Kathleen Colley is part of the Kathleen (Phillips) McNamara collection. Kathleen resides in Scottsville and is the granddaughter of Captain John Lee Pitts and Helen Amanda (Burgess) Pitts.